Did Dan Colman’s Comments Help Poker? There were a lot of interesting stories to come out of the 2014 WSOP Big One for One Drop, including Daniel Negreanu’s $8.3 million cash making him the all-time tournament winnings leader, celebutante Rick Salomon finishing fourth place, and the little-known Dan Colman winning this event along with $15.3 million. And the latter added an even bigger story that continues being discussed today. As many know, Colman walked out of the Rio after refusing to do any interviews. Speculation was rampant in the first few hours after the 24-year-old’s bizarre and ungrateful behavior. The way he was acting, you’d have thought that he was the first Big One player to bust out after having his pocket aces cracked by 2-7. Obviously what Colman stated didn’t cast poker in a very positive light. In fact, one might consider his comments downright damaging since he not only bashes the culture of pros chasing fish, but also being a poker pro in general. On the other hand, though, a number mainstream news sites have covered a gossipy story that would normally be relegated to eight or nine pages in a TwoPlusTwo thread. 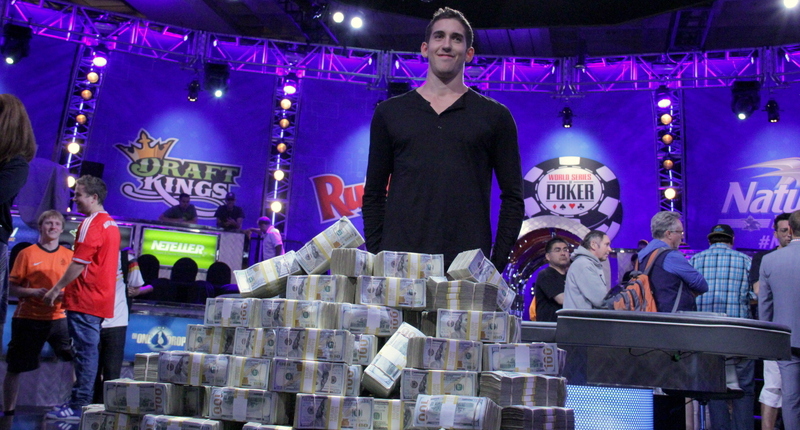 Given the mainstream coverage, did Colman actually help the poker world with his post-Big One display? First off, anybody who’d have won the Big One for One Drop and its $15.3 million prize would have been relevant and gotten some mainstream press. So I’m not saying that sites like Bloomberg, the Daily Mail, NJ.com and especially ESPN wouldn’t have covered this story anyways. But the fact that these sites can also discuss how a guy won $15.3 million, then refused to speak to the media afterward adds another dimension to this story. Let’s consider the common alternative in that Colman wins the Big One, makes a few cliche comments about how great he feels, and the story dies off a few days later. This might make poker look better, but it doesn’t hold casual readers’ interest the way that controversy does. It also has less of a chance of drawing readers to continue investigating the matter by checking out more links and diving further into the poker world. Okay, so it’s likely that Colman’s actions brought more attention to the game than any normal, poker-loving Big One champion would have brought. But what kind of damage did he do? Any aspiring poker player didn’t get a feeling of confidence upon reading Colman’s 2p2 post. This is especially true of the comments he made regarding how dismal a poker pro’s lifestyle is. I’m pretty sure that hundreds of other grinders would dispute these claims, citing their love of the freedom and financial stability that poker provides. But looking solely at what Colman wrote, nobody’s hearing this part. Some people play low stakes poker just to socialize. Poker is a competition just like everything else where the best rise to the top. The Big One raised $4.6 million for charity. Colman may not owe poker anything, but he could at least show some gratitude for the game providing him with a great living. Again, Colman’s intention certainly wasn’t to promote poker – far from it actually. But he created a much bigger firestorm of interest than if he’d just answered typical post-victory questions like any other winner. Home » Rakeback News » Did Dan Colman’s Comments Help Poker?